The recommended method for implementing a two position air actuator is a manifold solenoid valve assembly (MSVA2), a block-mounted pair of 3-way solenoids that pulses air to the actuator to switch it from position to position. If air is applied continuously, the continuous rotational force applied to the valve can cause sideloading, leaking, and additional wear. This implementation is described more fully in Technical Note 405. 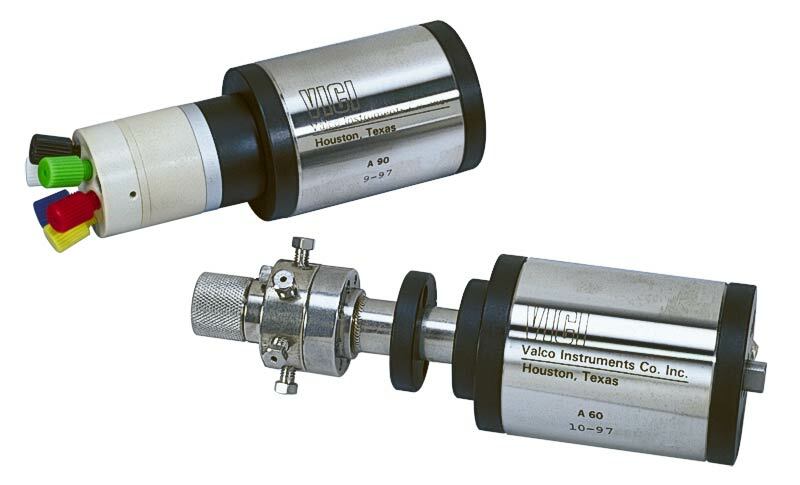 Typical actuation pressure is 40 to 50 psig, but up to 80 psig may be used. Ideally, you should use only enough air pressure to switch the valve in 1/3 to 1/2 second. 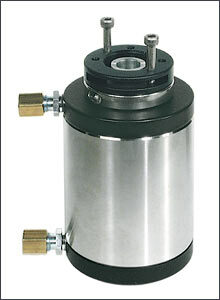 The actuator's rotation must be properly matched to the valve's. If you are converting a manual valve to air actuation and have any doubts about which actuator and hardware you need, contact our sales or technical staff for assistance. We recommend bottled instrument air or nitrogen. 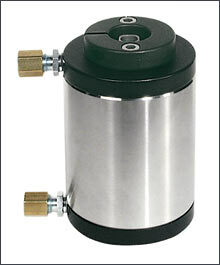 If plant air from compressors must be used, an oil separator and water dryer are required. The high speed switching accessory (HSSA) can reduce valve switching times to < 30 ms with air or 8 ms with helium. An actuator can be specified with closemount hardware, with a standoff, or with just the standoff mounting hardware, if your valve already has a standoff.